Here is something totally unexpected from Fantasy Printshop. 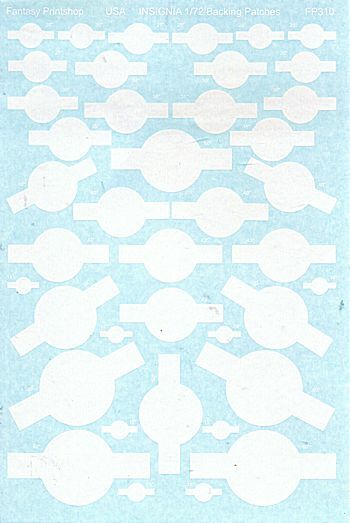 This a set of 'backing patches' for star and bar US insignia. The purpose of these is to provide a bit of additional opaqueness to standard size insignia. This is particularly useful if the insignia is placed on a dark or multi color camouflage surface. This particular set is to 1/72 scale. As with their standard US insignia sheet in this scale, there are at least four insignia in each size. These are 60", 50", 43", 40", 35", 30", 25", 20", 15" and 14". I think this is really a great idea and one that should come in very handy on future builds. Review sheet courtesy of Fantasy Printshop. They are available direct at www.fantasyprintshop.co.uk .